The leaders met for their annual glad-handing but this year was different. Tthis year Donald Trump had brought his family. Not only did he allow his daughter to attend meetings in his absence as his proxy, but he also cut a lonely figure as the only one to refuse to abide by the Paris Climate Change Accord. There were also the usual awkward handshakes and the handshakes that never were (the Polish First Lady leaving Trump hanging, even more embarrassingly than Macron did a couple of months ago). But there are at least signs that US President is finally getting to understand that international diplomacy is not a game show and other nations are not always as gullible as his worshippers in the US as it is no thought that he is having yet another reversal on the Paris treaty. But even as the leaders of other nations stand up to his foolish the British PM Theresa May was her usual obsequious toady in his presence. 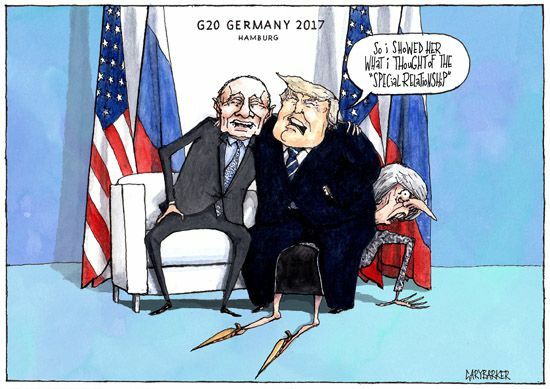 Hence the cartoon with the US President mocking the UK's over-used description between the US and UK and using the British PM as a chair and having a good old laugh about it with his best international chum, Vladimir Putin.